Last week, the whole team spent a lot of time making sure that the code and projects are well organized under a whole new set of repositories. You can find all the new repositories under the github.com/Activiti organization. A blog post will follow next explaining the changes and additions to our projects. I recommend to our community members to check the Activiti/activiti-cloud-examples repositories, where you can find a Docker based example of starting the whole infrastructure plus your domain specific runtime bundles (Spring Boot Process Enabled applications). @daisuke-yoshimoto he is trying to improve sending event data to Audit Service for performance issue and transaction consistency.Next, he is adding MongoDB support to Audit Service. @gmalanga still working on the elastic repository, for replacing the existing Spring-Data JPA repository for the query service with Elasticsearch. @abdotalaat working on getting a simple local identity service to support simple scenarios where SSO is not required. @fcorti continued to work on the activiti example. This time integrating the 'activiti-cloud-keycloak' container for authentication, ‘activiti-cloud-registry’’ implementing the registry using Spring Eureka and 'activiti-cloud-starter' to define a real microservice architecture for the departments (in the example). Next week is planned to complete the iteration. @erdemedeiros merged first iteration of query module into the master branch; created related starter in the activiti-cloud-starters repository. Currently adding more integration tests to the query starter. @salaboy mostly worked on creating the builds in our internal servers to make sure that we can publish docker images to docker hub and reviewed multiple times the example that we are building in activiti-cloud-examples. This week is all about refining our process to produce and publish docker images to Docker Hub and creating End User examples against our new services. We will be also looking at creating a initial version of our Kubernetes services descriptors. Notice: as part of our work to keep the project healthy we are closing all the issues in Github that are inactive. We take reported issues very seriously and for that reason we want to make sure that all open issues are being worked on. If you are involved in one of these closed issues and you still think that there is some work to be done there, please get in touch, re-open the issue and write a comment. All new opened issues will be worked on and have a person assigned to it that will report back progress. Join us in Gitter if you know or want to learn about Activiti, Spring Cloud, Docker and Kubernetes. After a week of moving things around, we are reaching a point where we can share the new structure of our projects and repositories. The changes introduced highlight the different nature of each of these projects and how are they going to be used and consumed. The changes are now considered stable and unless we find very good reason for a new re-organization, these repositories will be considered as part of the Activiti 7 project main efforts. The engine embedded in the application: this approach has major drawbacks regarding footprint of your application, memory consumption and adding too much responsibility. The same applies to the Query and Audit modules, which are now hosted in the same repository, but we might want to move those away in a future refactoring. This list will be expanded in the future with more services, and we will make sure that our services doesn’t overlap functionality that is already provided by the infrastructure or other popular components that you might be already using. A typical example for avoiding overlap, in this case, is the new SSO/IDM component that we are using. We are not providing any homegrown SSO/IDM mechanism as most of the BPM engines out there do. Instead, we are delegating that responsibility to a component that has been designed for providing that integration layer with SSO and IDM specific implementations. Finally, our last layer is the Infrastructure layer. Our new infrastructure layer allows us to provide a simple way to bootstrap all these services in a cloud-oriented way. We recognized that most of our users aim to run these services on existing infrastructure and for us, it is important to make their lives easier. This infrastructure layer is based on Spring Boot, Spring Cloud, Docker and Kubernetes, relying on and reusing all the services that they provide so our services can scale independently. Once again, by aligning our services to these technologies we wanted to make sure that we don’t overlap with the features that they provide. We want our users to feel that when they adopt Activiti, they don’t need to change their infrastructure or the way that they do things in their other services. Under the Activiti organization in Github we have created several repositories to represent these layers. These repositories are linked in our CI servers and arrows in the following diagram means downstream dependency. 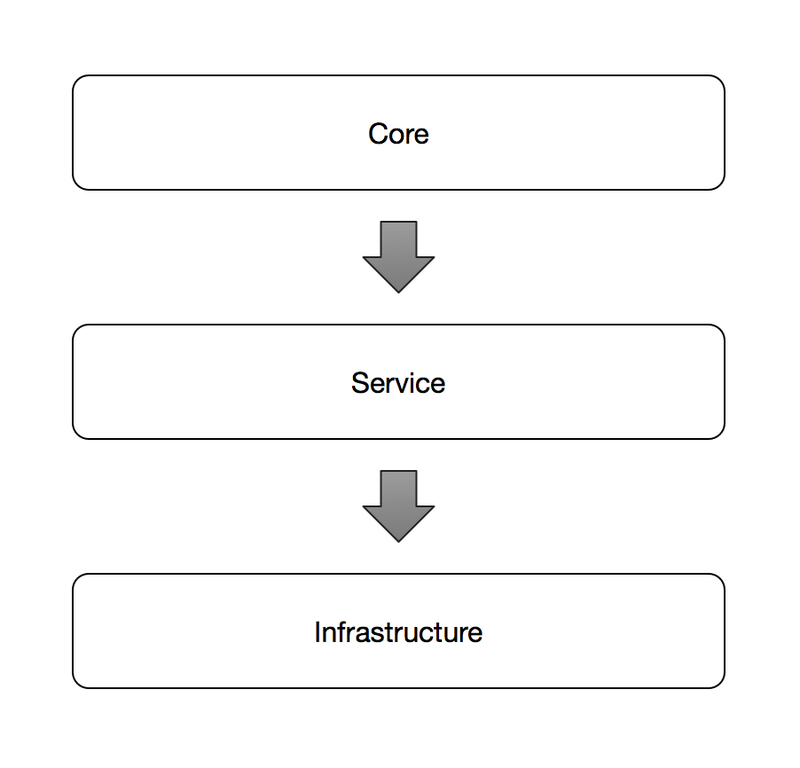 Every time that we make a change in the core engine all the services will need to be built and test again. Notice also, that all the repositories that depends on *-starters are going to generate and publish Docker Images to Docker Hub, meaning that you will be able to consume all these infrastructure without the need of compiling a single Java class. Our activity-cloud-examples repository will provide examples that show how to bootstrap the whole infrastructure in your dev environments and existing cloud infrastructures. One more important thing to understand is that we recognise that each implementation will probably want to replace one or more of these components, so you can end up using the example implementation as reference to implement your own components. If you think that one of your components might benefit the whole community then please get in touch- we can help each other with the design and implementation. You might have notice that we now have more services, more things to manage, possible different types of storage. Clearly the way of using the Process Engine is changing. This new approach will open the door to new scenarios, scenarios where we don’t work against a single clustered process engine. Scenarios where we want different components to emit events that will be aggregated by other components such as the Query and Audit service. Each of these different scenarios might have different requirements such as the use of NoSQL data stores to support graph based data or json documents for search and indexing. This new approach will also allows us to scale different parts of our infrastructure separately and responsively. Because of that all our services are dockerized and will require an orchestration layer to wire them together. The next section provides a quick intro to these docker images and how to get all the infrastructure up and running by following the activiti-cloud-examples. Notice that Cloud Connectors are not there yet. The client application represent your other microservices that might share the same infrastructure as Activiti. And Databases related to each services are omitted for simplicity, but the Runtime Bundle docker-compose is starting a PostgreSQL DB. 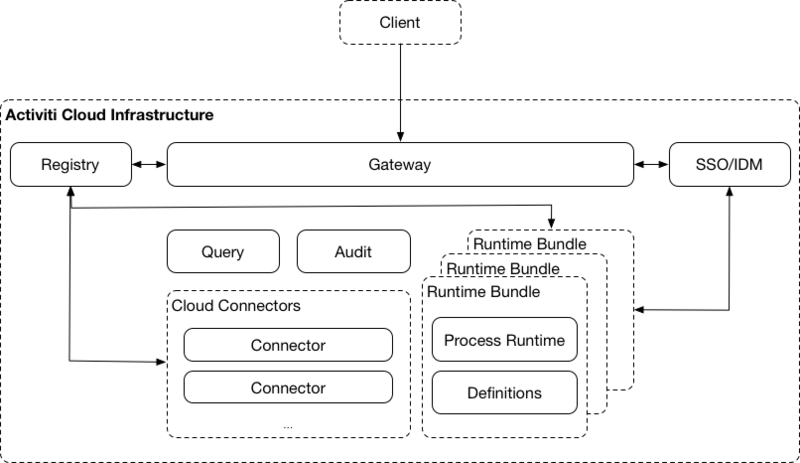 Also notice that the communication between these components is likely to happen in an asynchronous way, and for that reason we are also starting RabbitMQ as our message broker. Because we are relying on Spring Cloud Streams, the provider (binder) can be replaced with by some other providers such as Kafka and Active MQ. From a client/developer side, you only need docker to get all up and running in a couple of minutes. No java or maven is required to build your domain specific runtime bundles. You can use the (chrome plugin) postman collection to test the services endpoints. We will be working hard to make sure that we provide tools to package and version runtime bundles to make sure the the whole process of building and deploying these images is smooth and fast. More blog posts about Runtime Bundles are coming, which is a central concept in the new infrastructure. If you are interested, have questions, comments or if you want to participate in all these changes please get in touch. You can join us everyday in our Gitter channel, where we have open discussions about how each of these components are implemented.